Driftwood RV Resort and Campground was featured as one of the 17 unforgettable RV spots in Washington. Visit our Google Maps page to read reviews, or write one about your stay and help others find us. My wife, myself, and our two granddaughters stayed here for the first time in October 2018 and after a 2 night stay we fell in love with the place! Charlie is a fantastic host and wonderful person!! We are hoping to stay the week after Christmas through New Years! Fingers crossed!! Love this campground/RV park. We come here when we are going razor clamming. Super close to the beaches and it has everything you need and more including free firewood. Charlie will help you with anything you need. Even finding a cable cord to use. Super friendly people and a nice clean spot. This is a wonderful place to stay. Very close to the beach, and really nice newer facilities. Charlie the owner is just as nice and helpful as one could ask for. Not only did he greet us with firewood ready when we arrived, he took the time to help us park and set up. Driftwood is a great value and camp! quietest , cleanest, and friendly RV parks we have ever stayed at. We have been here about 7-8 months now. Staff is friendly and super helpful, Charlie and his family (the owners) bend over backwards to assist you with any problems you may have. AND he is expanding his facility to include another 20+ RV camp sites. We are about 1/4 mile from the ocean and can hear the surf. The pictures you see on this website, really do not do this facility justice. You need to come here, to see the beauty of this area, and experience the hospitality of Charlie’s family and staff. One thing my wife and I appreciate are the sizes of the lots. Plenty of space for both the pull through sites and the back in sites. Help is kind but not very knowledgeable about running of books and web info on their own place of employment… Web page is very deceitful on pricing of stays.. One price first and then it changes to higher rate plus fees once into site… Needs fixed but they don’t seem to care. Won’t honor weekly rates either, at least not once they have your money. Quiet surroundings and lots of construction right now but it doesn’t really interfere with it peace. Driftwood has become my happy place these last two years. When my daughter and I want to get away and enjoy the nature and sea air, Driftwood is where we stay! Everyone is wonderful and welcoming and the grounds are beautiful! Can’t wait to go back again soon! Perfect and quite. Friendly hosts! Bathroom and showers very clean! Enjoyed our experience- for sure to be back!! Awesome small park. 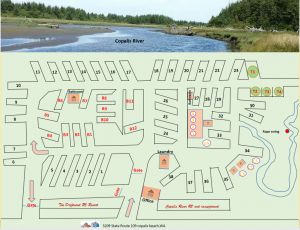 Close to the beach and a nice walking trail along the Copalis River. It’s partially under construction but that didn’t interfere with us at all. The part that’s finished is super well maintained. Nice hosts, big spaces, very dog friendly, and free firewood! We loved it! We’ll be back! We spent president day weekend 2018 here first time for us . Great place very friendly staff. We have a large RV sites are so nice and big! This is a GREAT place! Nice landscape, nice sites and wonderful people! Will stay again. Thanks Charlie and crew! This was our first time staying at The Driftwood RV Resort, and it won’t be our last! The minute we arrived we were greeted by smiling faces, happy people and the most beautiful campground. We felt like family from the first hello. Charlie, his family and staff are first rate. They genuinely care about this place and it’s visitors! We were scheduled to leave after three days to go to a State Park but after driving thru the State Park and seeing the spot we were to call home for the last two days of our vacation, we just couldn’t leave. Our spot in the State Park was small, had no water or sewer, and was in the middle of a small lake. NO WAY we’re we leaving our little slice of heaven at The Driftwood RV Resort! Our two dogs were welcomed by all the staff and received many pats and ear rubs. We are counting down the days until our next visit to the Driftwood and to visit with Charlie and his staff and Sarge! I just spent this last weekend at the Driftwood Campground and cannot say enough nice things about the staff. They were so nice and accommodating and anything that you need they were there to help. Thank you for a wonderful weekend and will see you when razor clamming season opens up. Outstanding park and the staff are top notch. These are the friendliest and most accommodating people we have come across in our travels. We had reservations for a place a few miles away and arrived there only to discover that they put us in a much smaller spot than we had reserved, and had no sewer hookups, cell phone service, wifi, or TV – and it was the week of the 4th of July! In a search for another park we could move to after the holiday, we found Driftwood RV Resort and Campground – and they have all of it! They were able to put us in great pull-through spot. There’s a river at the back of the park and on the other side of that is the Pacific Ocean. The park owner – Charlie – is upgrading everything and creating more spaces but keeping the mature trees and lush greenery. Although it’s technically under construction, we didn’t hear any construction noise. Patty and Vance who work for Charlie are super helpful and kind. We stayed several days and pulled out on a Sunday. But just a couple of miles down the road our truck developed a major problem. We called Charlie to see if we could get another space until we could get it fixed. He said not to worry – that he’d make room for us and he move our RV with his own truck if needed. Then he set out to find us on the road. We managed to get the RV back to the Charlie’s park and he gave us a list of local repair shops he would recommend. He even got under the hood to see if he could figure out what the problem was. It took several days to get the truck fixed, but in the meantime we got to enjoy the peace and beauty of this park. We highly recommend Driftwood RV Resort and Campground! Its great now and will only get better as the improvements are finished. And you won’t find better customer service anywhere! This is the second time we have stayed here and we will definitely be back. Our dog was very happy being able to go for walks through the nature trail and out to the Copalis River. The staff is friendly and welcoming and Charlie is doing a wonderful job with upgrading and making this park a place people want to come to time and time again. Our puppies loved the quick access to the water to play in. We had a great few days there and will definitely come back often. Great people. Nice sites. Super helpful. We came for clamming and the wdfw didn’t ok the dig until the day before. The Rv park was willing to allow us to cancel the day before if it was cancelled. We really appreciated the understanding, glad we didn’t need to. Good place to stay. Free firewood, pull through sites, all utilities worked great. Well maintained park. My husband and I stayed here this summer and had a wonderful time. Charlie, the owner, is working very hard to make improvements to this RV park which he’s only owned for 3 years. A lot of landscaping got done this summer and when we left he was working on finishing his new RV sites. Charlie, the staff and the people staying there were all very friendly and helpful. We will stay here again when we return to the area. Can’t wait to see all of the new improvements!!! We spent a girls weekend “glamping at Driftwood RV Resort a few weeks ago! It was a really nice RV park! Big level sites with full hookups and cable TV. The free firewood was a nice touch…and when we were gone for the day the firewood fairy brought more! Charlie was awesome! He even offered to help us set up! (which we declined LOL!) 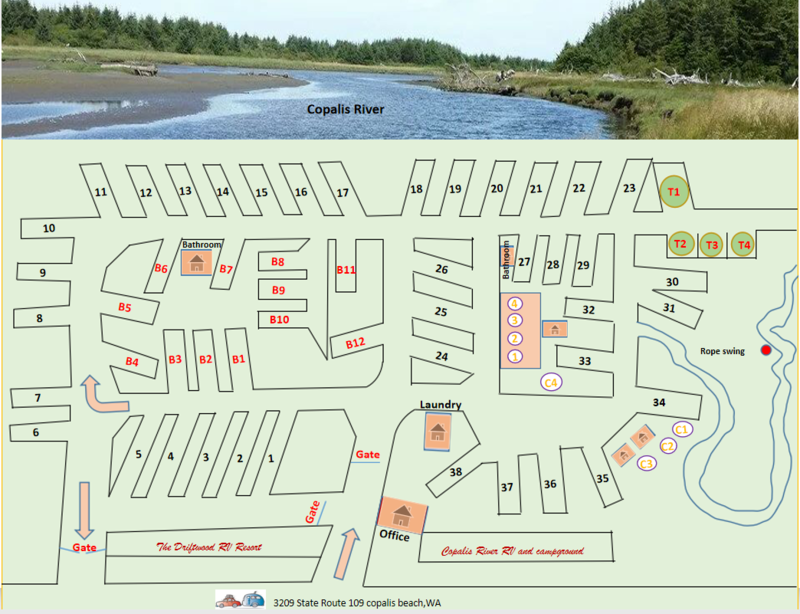 Nice place to explore, right on the Copalis River and close enough to the ocean! We felt safe and that our stuff was safe due to the gates and the fact that Charlie came through the campground regularly! It will definitely be a destination place for us in the future! Can’t wait to see how nice the new sites turn out when Charlie is all done! They have nice big sites, full hookups, cable tv, and nice clean grounds. Oh yes and free firewood. There whole staff is a very friendly. We will definatly stay here again. Charlie is doing a great job remodling the campground….cant wait to see what it looks like when he is done. We enjoyed our stay very much! Thanks Charlie. We’ll be back next year and will recommend your place for sure! Another great stay at Driftwood RV Resort. A great place to camp on the coast. Two more trips planned this summer. Tired of congested RV sites? Ready to abandon commercial enterprises? Then you’ll love this little gem in the heart of Copalis. The grounds are lovely & well maintained. Sites are spacious, level & clean and equipped with easily accessible hookups as well as a FREE bundle of firewood! For we dog lovers, there’s several nature trails and walking areas for them to roam (even off leash). The ocean beaches are nearby, though a 5 minute drive is required. And, should you need to replenish supplies (and who doesn’t when the need for razor clams arise), then Ocean Shores is not far, where a well-stocked IGA, a fish market and many great restaurants offer too many options to list. Or, if you’re given to Twilight Fever, then head up the coast for a mesmerizing meandering in the rainforest. We’ll be back, if for no other reason than to see what the owner, Charley, has added. He’s committed and hard working that makes one feel like family, even our dog. One note: given the park upgrades underway, as well as several nearby permanent residences, some might think twice about this park. It may not be for you, but you needn’t worry. It’s lovely, safe & quiet. My family and I stayed here over spring break. We had a fabulous week and Charley was a great host. We liked staying away from the high tourist traffice of Ocean Shores, but close enough to go there and enjoy the fun activities. Beach access was also very close just to north with drive on access and plenty of beach with very few people. The campground offers a nature trail and rope swing that our girls couldn’t get enough of. Charley acquired a very run down campground and is doing a great job of renovating. We will definitely be back. My wife and I and our very large poodle have stayed here three times now for a month each time. The sites and hookups are first rate. They are large, solid, dry and very user friendly. The people are very friendly and helpful with any problems you may have and very pet friendly. Although the park does not have direct access to the ocean, it is a very short drive to the beach where you can drive for miles in either direction. Our poodle loves running on the beach. We would highly recommend this resort if you are in the area. My family and I stayed here last weekend and loved it! Charlie was so nice and accommodating. We came to the ocean to do some razor clam digging and could not find a campground with any open rv sites. Charley got us hooked up to power and water in our camp trailer in a nice grassy overflow area. It’s located right in between the copalis beach and mocrocks beach, not far from ocean shores. Will definitely come back! We have been here twice now and we will definitely be back. Charley the camp host and his family are amazing. They go out of there way to make you feel welcome. The camp ground is spacious and clean. We are looking forward to our next visit. We have two more trips planned this summer. The hosts are wonderful! We love the location. Close to coastal attractions and things to do. Large pull-in sites with full hookups. It’s a great place to stay! We rolled in late in the afternoon on a Friday planning to spend the weekend digging razors and expecting to easily find a site, only to learn that it was the weekend of the Ocean Shores Clam Festival, and every RV Resort was booked. After being turned away from about four RV resorts, we rolled in to Charlie’s place, and although he had been booked out for months, he moved his personal vehicle, got us a hose and an electrical hook-up, and let us stay. I should add that this was also our first trip in our camper, and although we had been shown how to use everything once, it had been several months since we bought the camper, and neither of us could remember how it all worked, Charlie jumped right in and helped us figure it all out. He lives on site with his wife, daughter, and sweet old dog, and they are all incredibly friendly and welcoming. The resort overall has a very friendly, family-like feel as many of the occupants have been staying there for years, and know each other well. We were welcomed by a group staying at the resort who took us out, showed us where to dig, and then helped us clean and separate our razor clam catch. We had the most fun weekend ever, when it could have been a disaster, thanks to Charlie and his crew. Nice roomy pull-thru sites, new hookups, all at a great price. And Charlie is a friendly host, who goes out of his way to accommodate you. We found the place by accident, but we’ve already stayed there twice! We’ll definitely be back. And we recommend you give it a try yourself next time you’re in the area. Charlie and his family are awesome hosts and the grounds are looking amazing! Great job and thanks again for all your hospitality! We have been camping in the Ocean Shores area for several years now and Driftwood RV Resort is far the best campsite we have been to. Charlie is the best camp host and owner we have met. Highly recommend the Driftwood Resort to everyone who is looking for a great place to camp.